The powder room is one of the spaces in your home that are meant to be small. But that doesn’t mean that it can’t be beautiful and functional. This space is for your guests. It should be inviting and maybe even stir up some conversations. And, because it’s a small space, you can be more daring without having the huge commitment of large room. Don’t be afraid to show off your personality with fun colors, prints, and wall coverings. Do something daring. You can use the same color palette as the main area of your home or use a different one. You can go as simple or as bold as you want to with your powder room. It’s a space that you can use to really get creative. I love designing these spaces and wanted to share a few of our client’s show-stopping powder rooms. One of the common misconceptions about design is that you have to use bright colors or big prints to make a statement. A natural color palette can work just as well. The shimmery gold tile we used in this powder room elevates the space and makes it feel very luxe. This powder room is one of my faves! 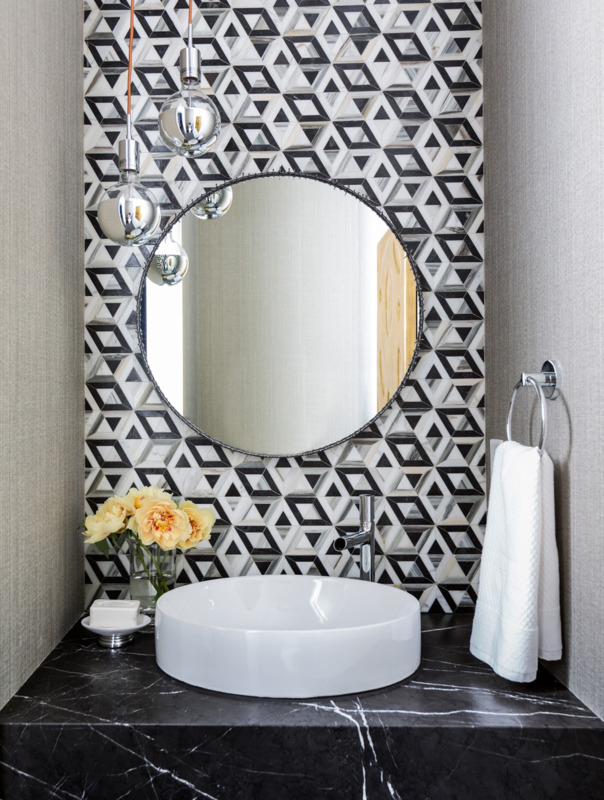 We brought the art deco vibe that inspired the design of the rest house into this space with a graphic, black and white geometric tile. It mixes our client’s love for bold statements and art into something that is both stunning and functional. It makes the small space stand out and is a conversation piece for guests. Powder baths are so fun to design because you can really let go and make some playful selections. 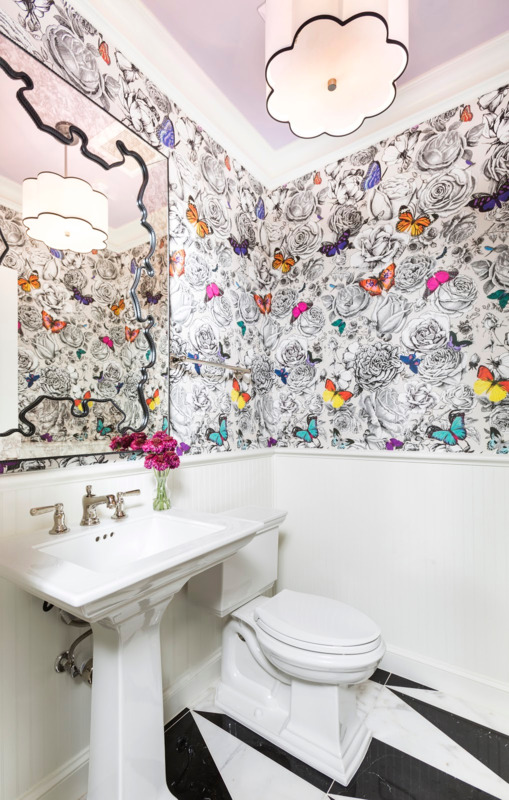 Butterflies, which are something personal and special to our clients, were the inspiration for this whimsical powder room. The shapes and the movement of the rounded wings in this colorful butterfly wallcovering are mimicked in the mirror-lined mirror and sweet flush mount light. The striking black and white floors paired with the lavender ceiling add to the drama of the space. This design is definitely unexpected, but is sure to bring a smile to guests! You don’t have to contrast with the rest of your home’s interior. 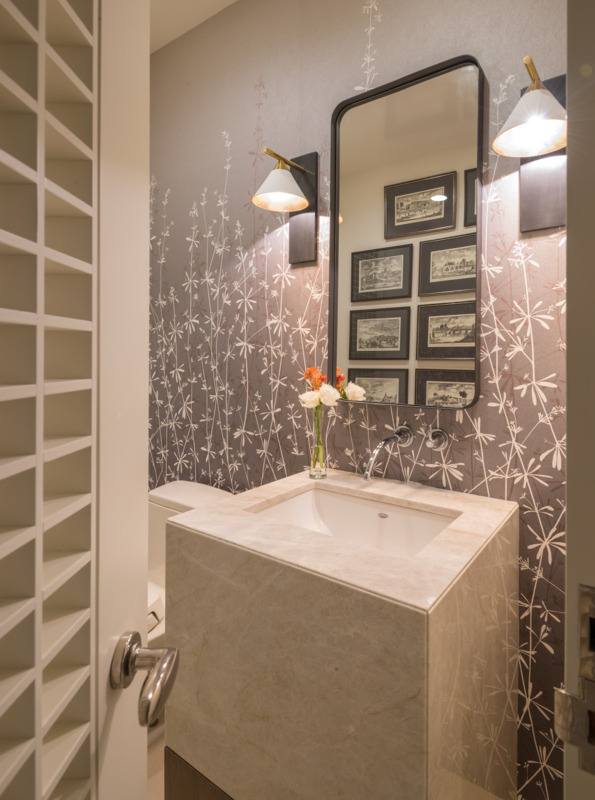 We kept the neutral color palette of the home in the powder room and used a printed wallcovering to create interest. This vertical floral pattern is sweet and complements the gallery art and Euro-Asian influences that inspired this home. 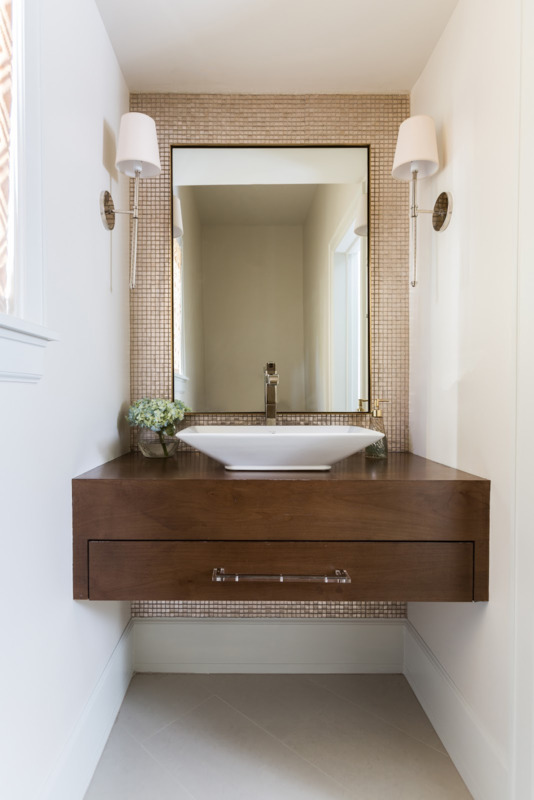 Powder rooms are meant to be small, so a great way to create storage options is to use a floating vanity or vanity with drawers. Just remember to keep the size proportionate to the size of the space. Don’t try to make the space something it’s not. It may seem like using darker colors would make the space feel constricting and too dark, but it won’t. 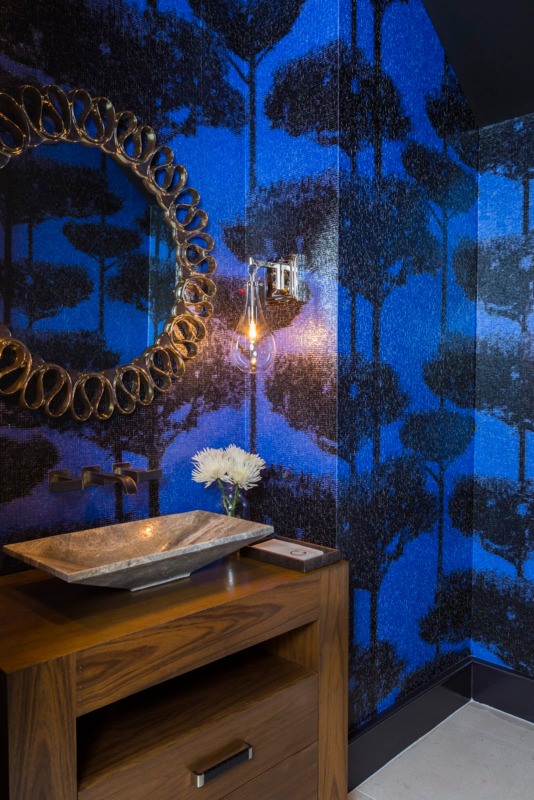 A deep and moody wallpaper is a fabulous selection for a powder room. It’s totally okay to use dark color here! When you design your powder room, don’t be afraid to think outside of the box! Create a design is unique, but one that still complements the rest of your interior. Whether you choose tile, mosaics or wallpaper, pick pieces that represent your personality. Allow your creativity to flow! For more design inspiration for your powder room, follow us on Pinterest and Instagram.